Opium, till today, is the best known source for relieving pain.The word "opium" is derived from Greek word "Opion". In Arabia it was known as Afyun, in Chinese it is "Yapien", in Persian it is known as "Afium", in Sanskrit the ancient Indo-aryan language it is known as "Aahi Phen" meaning snake venom.In the North-East part of India, it is referred to as 'Kani'. The opium poppy (Papaver Somniferum L.) belonging to the family Papaveraceae, is an annual medicinal herb. It contains many alkaloids that are frequently used as an analgesic, anti-tussive and anti spasmodic in modern medicine. Besides, it is also grown as a source of edible seed and seed oil. India is the only country authorised by the United Nations Single Convention on Narcotic Drugs (1961) to produce gum opium. Eleven (11) other countries, i.e, Australia, Austria, France, China, Hungary, the Netherlands, Poland, Slovenia, Spain Turkey and Czech Republic cultivate opium poppy, but they do not extract gum. They cut the bulb with 8" of the stalk for processing in its entirety. This method is known as Concentrate of Poppy Straw process (CPS). Opium poppy has been cultivated in India since the 10th century. The Dhanvanatari Nighantu an ancient Indian medical treatise of the 10th century lists opium as a remedy for a variety of ailments. In the early part of 16th century, opium was cultivated in India as a federal monopoly during the Moghul period. The Ain-e-Akbari, a historical record of the times and period of Moghul Emperor - Akbar (1556 to 1605AD) states that opium was cultivated in all the provinces of North India scattered over an area of more than one million sq. km. After the decline of Moghuls, the Britishers controlled opium production from year 1773. After independence the Indian Government checks and monitors its production and usage. In India, opium poppy involves lancing and collection of latex from the incised capsule. It is laborious and skilled job requiring considerable manpower to accomplish the task in a short time span. The capsule is the most important organ of the plant as it provides raw opium - a milky exudate. 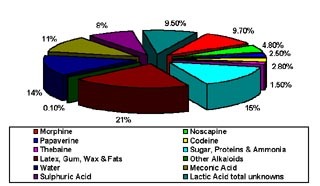 It contains about 70% of the total morphine synthesised by the plant. The terminal capsule is, in general, richer in morphine content than the lateral ones. The lancing is the longitudinal or circumferencial cut/incison by an instrument, of the capsule at appropriate stage. The instrument comprises of 3 to 6 sharp blades of steel or iron affixed to a holder of sufficient length, or all tied together, each spaced a few millimetre. The lancing operation is performed by skilled workers in the afternoon, so that a crust is formed on the surface of freshly exudated latex, due to the hot sun. Starting from the top, the workers move backwards to the base, in order to escape contact with exuding latex and to keep the incision facing the sun. While lancing the appropriate stage is identified by touch, a skill acquired by years of experience; the depth of incision is also an accomplished, precise art. By next early morning, the latex semi-solidifies, and is collected by scraping with a trowel. Opium poppy is an extremely delicate plant greatly susceptible to changes of weather, and predisposed to certain organic diseases. If the field becomes waterlogged, the plants wither and die. Rain at the time of harvest washes away the latex and reduces the yield considerably. High velocity or dry winds are detrimental because they tend to dry the plant quickly and check the flow of latex. In damp climates the crop is attacked by fungi, bacteria etc. Dew during the lancing period increases the apparent yield. Hailstorm destroys the plants and the young plant can be wiped out by frost. At the end of its growth period, the plant needs warmth and dry weather. Humidity, temperature and wind thus have a great influence on the yield of latex. The plants require constant care and attention and need to be saved from damage by diseases, pests and parasites, birds and animals. Mildew attacks the leaves which turn blackish brown and finally dry up. Root parasites often prevent the healthy growth of plant. Specific treatment, selective use of insecticides, proper weeding and thinning operations, removal of affected plants and adequate but not excessive irrigation must all be rigidly adhered to for a good yield of latex and seeds from poppy crop. Downy Mildew - is one of the most serious and wide spread diseases of opium poppy. It causeS hypertrophy and curvature of the stem and flower stolks.. the infection spread upwards from the lower leaves. The entire leave surface is covered by brown powder. The stem, branches and even capsules are also attacked resulting in premature death of the plants. In India, the disease appears annually on the crop from seedling stage to maturity in opium poppy growing areas of Madhya Pradesh, Uttar Pradesh and Rajasthan. The formation of capsules is adversely affected due to infection. Consequently, opium yield is significantly reduced. Powdery Mildew (Erysiphae Polygon) - is another minor fungal disease, however, it caused severe damage to opium crop in Rajasthan in 1972. It is general noticed at later stage of growth of plant and is characterized by white powder on leaves and capsules. Field sanitation is important to control this disease. Leaf Blight - The symptoms of the disease appear defused yellow spots, followed premature drying of infected leaves. During the course of parthogenesis, toxins are released by the parasites enabling it to assimilate the requisite nutrient. This disease is favoured by high temperature and heavy rainfall. Leaf Spots - This disease is characterised by chlorotic areas on the leaf, often accompanied by curling. However, all the leaf spot diseases observed till now on this crop were of minor importance, though there is a distinct correlation between leaf spot infection and decline in morphine, codeine and thebaine content of the poppy plant. Capsule Infection - This disease causes large velvety black spots to appear on the green capsule. It reduces the morphine, codeine and thebaine contents in opium poppy capsule. Capsule rot of opium poppy caused by a particular fungus entailing in severe damage is prevalent in Rajasthan. A severe capsule rot caused by another fungus was also observed in opium poppy crop grown at Lucknow. Wilt & Root Rot (Fusarium Semitectum) - This disease occurs during the advanced stage of growth, causing rapid wilt and desiccation of leaves. The infection originates at the stem base and is accompanied by damping of roots. Black necrotic leasions develop on the cortex of the stem. The symptoms of the disease are characterised by withering and drying of the leaves, early maturity and low opium yield. This disease can be controlled by removing infected plants and by spraying of recommended chemicals of appropriate doses. Bacterial diseases cause considerable damage to the crop. The symptoms are systematic in nature. One such bacteria gains its entry to the host through stomata and waterpores. In later stages it penetrates the vascular system and multiplies. The seeds from infected plants are discoloured and malformed. Another bacteria attacks all organs of opium poppy plant, the general characteristics of disease being brown to black brown spots on poppy seeds. Several viral diseases cause extensive damage to opium poppy. Cabbage ring spot virus was observed to be capable of infecting opium poppy. The infection rapidly becomes systemic and causes yellowing of plants and elongation of stem. Opium poppy is also susceptible to beat yellow virus. The symptoms appear as irregular chlorotic band along the veins which spread very fast all over the interveinal areas, leaving green strips along the veins. Infected plants were found to be stunted. The virus is transmitted mechanically from poppy to beans and from naturally infected beans to poppy. A mosaic disease of opium poppy was observed in India. The disease caused stunting vein banding and deformed capsule formation. The virus is readily transmitted from the sap. The disease was also found to be transmitted by aphids. Boron deficiencies in poppy plants result in floral and capsule malformation, seed necrosis and in severe cases, inhibition of growth in early stages. The symptoms cause stunting, dark purple or brown discoloration, distortion and crinkling of leaves accompanied by partial yellowing or blackening of veins. The symptoms of heart rot were associated with rotting of leaves, discoloration and decay of plants. The opium poppy is attacked by number of insect pests associated with root damage (Root Weevil), associated with leaf-stem damage (Aphids), associated with floral damage (Thrips and Sawfly), associated with capsule damage (Head gall fly, Capsule weevil and Capsule borer). In sum, the weather conditions, plant diseases, and soil composition all have a bearing on opium gum yield.